Some years ago I discovered that a chicken could be seasoned under the skin with salt, pepper, butter, and herbs. It makes for excellent roast chicken, and I decided it would be the only way to go in the future. But it is also a bit finicky, and somehow roasting a chicken became an unwieldy affair in my mind. Until recently, when I came across good chickens from Epicurean Farms. They are fairly small, very tasty, and usually sold whole. So I started roasting again and rediscovered that it is actually probably the easiest way to cook these animals, especially if you are not chopping herbs and delicately stuffing them under the skin. Now roasting a chicken seems effortless like an afterthought; it can be done for lunch or dinner, or after dinner – at anytime, really, since it is excellent cold, especially with green tomato chutney. 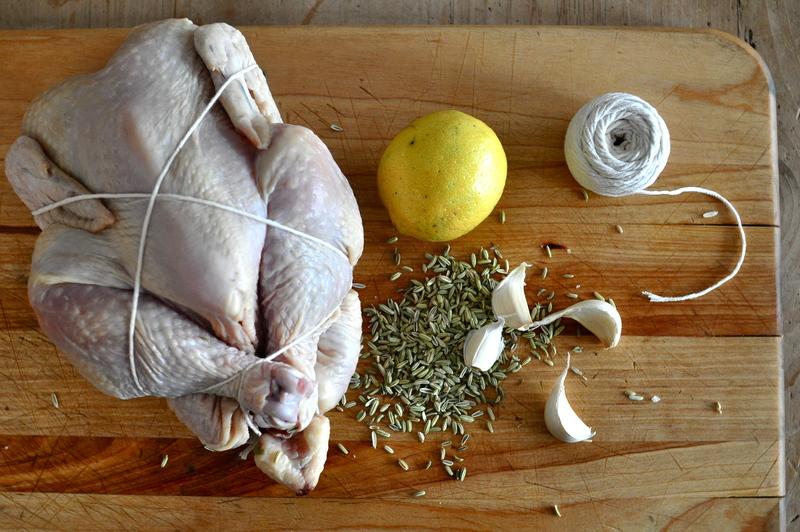 Chickens can be stuffed with any combination of herbs, garlic, or onion on hand and I usually add a lemon, slashed so it releases its juices. This version with fennel seeds was a staple in our house when I was growing up. Pat the chicken dry with a paper towel. If you remember to do it in advance, let the chicken sit uncovered in the refrigerator for a few hours so the skin dries out before roasting. Season the cavity of the chicken with salt, pepper, and fennel seeds. Poke the lemon with a fork multiple times on all sides and stuff it into the chicken with the whole, skin-on garlic cloves. Truss or just bind the legs together with kitchen string. Massage the chicken all over with softened butter and season the outside again with salt and pepper. Place the chicken on a roasting pan and into the oven for 10 minutes at 425°F (220°C) then lower to 375° (190°C) and roast for 40-50 minutes, depending on the size of the bird (large chickens may need to cook even longer — pull away one thigh and if the flesh at the joint is still translucent pink, cook a little longer). Let rest 10-15 minutes before carving. Squeeze the lemon over the pieces of chicken before serving. This entry was posted on 6 January 2011 at 12:06 and is filed under Easy, Fall, Spring, Summer, Winter, Year-round. You can follow any responses to this entry through the RSS 2.0 feed. You can skip to the end and leave a response. Pinging is currently not allowed. Tried this again last night with fresh English peas…decidedly our favorite roast chicken recipe by far! Thank you for the note, it’s much appreciated! And with fresh English peas – perfection. sounds so good! i usually use rosemary, but will try fennel seeds too. Happy weekend, Kristina! I also use rosemary, thyme, or marjoram, with bay leaf and garlic and lemon in some form, either whole or just a ribbon of rind. But the combination lemon/fennel is really wonderful – and tastes like summer in the middle of winter! I love Epicurean Farms Cornish hens. I usually make two, even though we only eat one so that we have the other for pot pie, soup or snacks the next day or two. I don’t truss my birds though, I sort of flay them open and let them air dry for 30 min or so before I put them in the oven. They don’t look as pretty untrussed, but more of the skin gets exposed to the air and the skin crisps up beautifully. Will add fennel seeds to our weekend birds — love that suggestion! I haven’t made Cornish hens in years! Good idea. I will get some next time.